A long and rich history brings with it the inevitable legends and local stories that introduce some colour to the human heritage of the valley. How much is based on fact and how much was contrived to make good story telling at a time when few people were literate is anyone's guess. Still, it certainly makes for a good read. The oral art of storytelling goes back to the first days of human communication. It is only in relatively recent history that the general populace has had access to schooling in reading and writing, so professional storytellers were everywhere in the valley providing gripping stories and entertainment wherever they went. Folk tales provided a good method of passing on information that would also be helpful to people, and this was not restricted to children but also provided education for adults too. Many stories were also accompanied by music which eventually evolved into the art of folk songs. Guildford had its very own alchemist who claimed he could turn base metals into gold. James Higginbottom was left a fortune by his uncle upon his death in 1781. One of the conditions attached was that he change his name to Price, meaning that the now James Price in effect became in name his uncle. With his new money James bought a small country estate in Stoke, a village as it was then just to the north of Guildford. There he established his laboratory with the initial intention of dedicating his time to chemistry, a long-time hobby. Such was his commitment he had become a Fellow of the Royal Society, the most influential scientific body in the land at that time. In 1782 Price announced to an astonished world that he had discovered elements for making a catalyst, his very own Philosopher’s Stone, that could turn mercury into silver and gold. At a public demonstration, by heating secret powders and various other substances mixed with mercury, sure enough right in front of the observers’ eyes they saw small amounts of silver and gold produced. Price provided a sample to be tested which proved that the substances were indeed gold and silver. George III personally inspected and approved specimens of the wondrous gold, and Price was bestowed with an honorary doctorate by his university. Gradually following the refusal of Dr Price to divulge the secret as to how his alchemy was done, a storm of protest, which had begun to tarnish the reputation of the Royal Society, had blown up to such a degree that Dr Price was summoned before the society to provide a demonstration under the scrutiny of expert scientists. In August 1783 he invited a deputation from the Royal Society to his house in Stoke. As the scientists began to examine the apparatus they heard a commotion behind them. Turning around they found Price lying on the floor, stone dead with an empty bottle of prussic acid in his hand, a sure way of ensuring an immediate end to his life. A resident in the borough of Guildford set up a curious charity in 1674. In his will he left a sum of £400 to be invested and the interest of which was to be paid to a maid-servant who had served for two years with good character in the old borough. A list of eligible candidates was proposed each year from which a short-list of two was selected. The two candidates would then each throw dice, and the maid who threw highest won the money. Some time later a new practice was devised whereby the loser would be able to lay claim to money left by a John Parsons for apprentices, if this had remained unclaimed in any particular year. The apprentices’ award was actually higher than the Maid’s Money so reality became reversed with the winner actually losing and the loser winning. The poor in the Wey towns of Farnham, Godalming and Guildford all benefited from the generosity of philanthropist Henry Smith (1548 – 1627). A silversmith of some considerable wealth, Smith gave £1,000 to each of the towns to be used to lessen the plight of the poor. The story goes that such was his eccentricity he would often wander the country lanes dressed as a beggar, with his faithful dog always at his heels. He was once whipped as a vagabond in one parish, and so never left it a penny in his will. 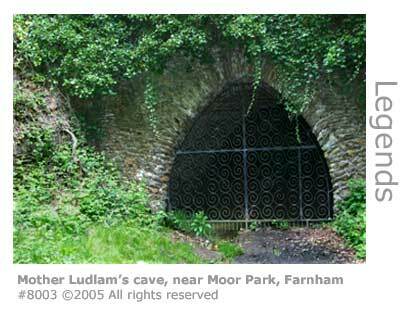 Mother Ludlam was a white witch and herbalist who reputedly lived in caves close to Waverley Abbey and Moor Park a few miles outside Farnham. She was a kindly generous person who would quite happily loan out her possessions on request. One day a large cauldron was borrowed but not returned, and Mother Ludlam fell into a foul rage. 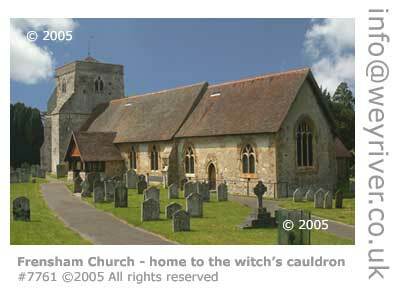 The borrower became so frightened that he took the cauldron to Frensham Church to seek refuge, and there the cauldron remains to this day. There have developed over many centuries a great variety of versions of the legend about the cauldron. Another recorded in 1937 has the cauldron located in Mother Ludlam's cave in which she would make up potions. One day the Devil came in disguise and asked if he might borrow the cauldron, but Mother Ludlam seeing his distinctive footprints in the sand refused. The Devil seized the cauldron and made off with Mother Ludlam in hot pursuit on her broomstick. The Devil made giant leaps, his feet forming hills wherever he landed, hence the hills near Churt known today as The Devil's Jumps. The Devil dropped the cauldron on the last of the hills, Kettlebury Hill, and vanished. 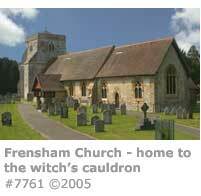 Mother Ludlam took the cauldron to Frensham Church for its safekeeping. The liveliest version, which was popular in the 1920s, was that the cauldron could be borrowed by climbing the hill south of Frensham village called Stony Jump, and whispering to the fairies who lived there through a hole in the huge outcrop of rock on the summit. All went well until the cauldron was not returned on time. The fairies refused it and condemned the unfortunate borrower to have the cauldron follow him wherever he went. Eventually, tormented by the presence of this three-legged pursuer, he sought sanctuary in the village church where he collapsed and died, leaving the cauldron trapped inside. The cauldron, made of hammered copper and measuring three feet (0.91m) in diameter and 19 inches (48cm) deep, in fact is of the type that was commonly used in the Middle Ages for catering at parishioners' weddings and religious festivals. We're still developing this section. If you know of any legends or tall stories about the Wey Valley please let the editor know.